From powered exoskeletons to drones that deliver medical supplies, robots are increasingly making their way into medicine. Robots have already revolutionized medical device manufacturing, but now they're coming out of the factory and into the clinic. Valued at $1.8 billion in 2013, the market for medical robotic systems is expected to more than double, to $3.8 billion, by 2018, according to market research firm MarketsandMarkets. And although surgical robotics date back to the 1980s, robots today are being used for everything from disaster response to diagnosis. 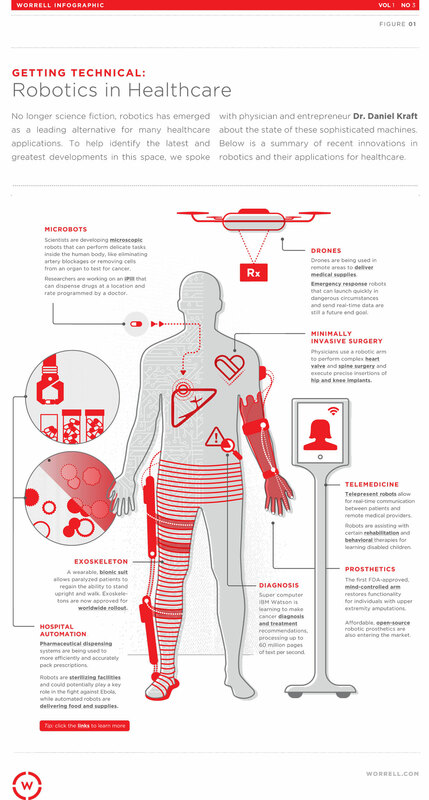 This infographic from Worrell, a product design, development, and strategy firm that collaborates with medical device companies and entrepreneurs, shows just some of the ways that robots are reinventing the way healthcare is delivered. Learn how robots are revolutionizing manufacturing at the MD&M East conference in New York City June 9–11, 2015. Jamie Hartford is MD+DI's editor-in-chief. Reach her at [email protected] or on Twitter @MedTechJamie.